What does foot-washing have to do with worshipping God? Worship is a response to God. A God who is love. Worship is the I love you too, response to the God who has first said I love you. I want you to pay attention to this, because as we prepare for the events of the next few days, I think it’s important that we know why we do what we do. Here in our gospel we have Jesus, giving us a commandment to love one another. Jesus, showing us that to love is to serve. Many of us are used to hearing this story I think. It is a beautiful one; layered, and complex and full of intrigue and challenge and flawed human beings and love. We are here in church because by showing up we are saying that remembering these acts is important. And so it is. 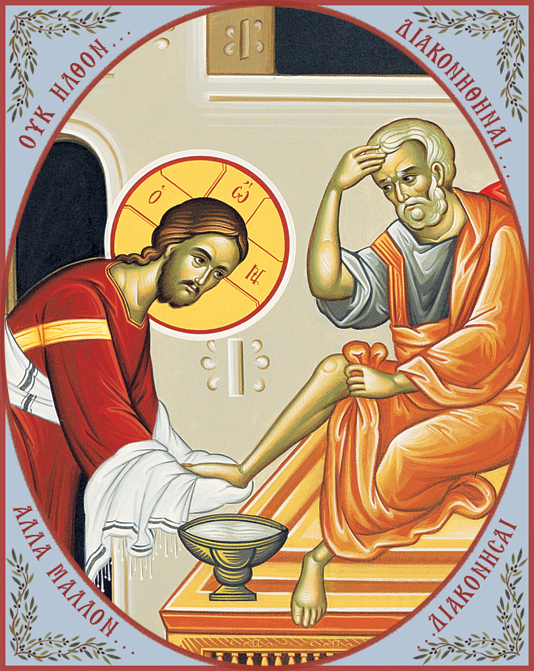 But I often hear that people don’t know quite what to make of the foot-washing. John's Gospel is the only one to mention it. We do not have a similar comparison to make in our own culture, so foot-washing already can feel a bit odd or uncomfortable. We know it was shocking to them to have Jesus offer to wash their feet, because we are told it was. But we cannot put ourselves so easily in that situation. And it can feel a bit personal, getting your feet out in church. So why do we do it? How many of you feel that serving others is important in your life? From those I’ve met, I would say it is the vast majority of you. We can always do better and do more of course, and we tell ourselves this. “There aren’t enough hours in the day”. "There is always more to do". We know that we ought to follow Jesus’ example of being a servant king, and I believe that many of us strive to do so. But through this striving to do things for others, to serve (whether that is for our families, for strangers, for our church family), I think there is a danger that we begin to believe that this is where our worth comes from. We love God and so we follow his teaching and we serve others and then God will love us too. Do you notice right away what is wrong with the order of this sentence? We love God - and so we follow his teaching - and we serve others - and then God will love us too. No. That is like us saying to God “I love you” and waiting for him to weigh it up before responding. Remember when I asked you to pay attention at the start? God already loves you. God is love, all the time. The commandment we follow is to act OUT OF THAT LOVE, not act to earn it. We are so easily caught in the falsehood that it is through proving our worth that we deserve to be fully loved. God is the great “I love you.” Do you realise that it is you he is speaking to? When revisiting this passage throughout this week I kept being drawn towards Peter. Peter is complicated. I like that. I imagine him sitting there watching all the others have their feet washed, stewing over the fact that this didn’t seem right. (He wasn’t the first one in line after all [John 13.5,6]). When it came to his turn, Peter didn’t deny that Jesus loved him, but he didn’t understand how to let Jesus love him. This was not about words, but about action on both sides; about Jesus, the king, on his knees in front of a man who - let’s not forget - he knew would deny they had even met just a few hours from this moment. Jesus serving Peter is an action of love. But inherently it is an action with a counterbalance: Peter must allow Jesus to love him. You, lovely servant-hearted people, do you allow Jesus to first love you? 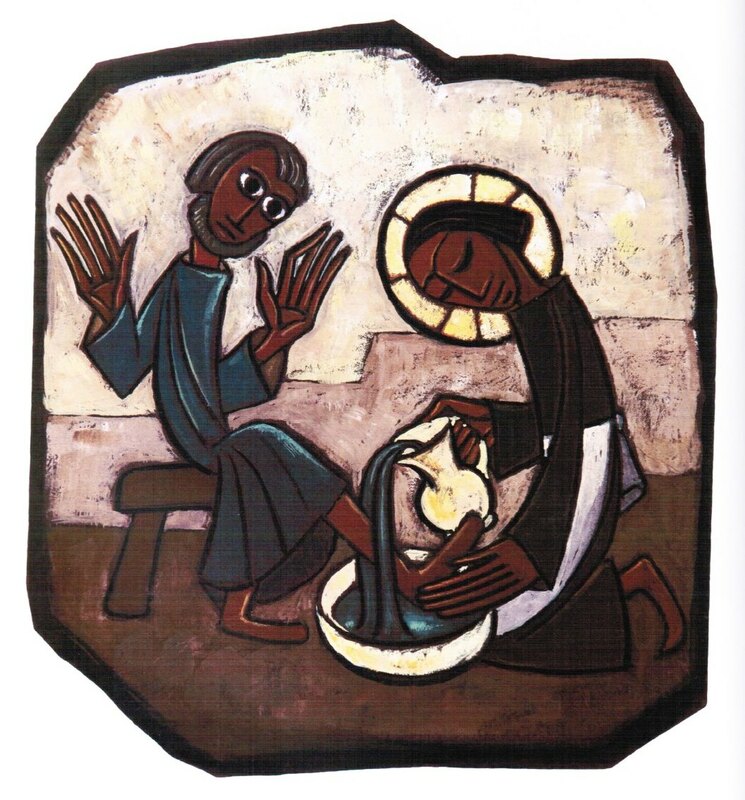 If you look through iconography or paintings of the foot-washing you may begin to notice that Peter often has his hand to his forehead, seemingly expressing some discomfort. Not being well-versed in the subtleties of hand-gestures in iconography, I nevertheless saw what could be bafflement, despair, or wrestling with deep theological complexity, or maybe even exasperation. We don’t know everything that was going through his mind, but we do know that Peter found this difficult. And also that he misunderstood it [John 13:7]. At first he resists entirely, saying that Jesus will never wash him. Then when Jesus is firm about this being the way to share with him, Peter capitulates to the other extreme “my hands and my head also!”[John 13:9]. But he has it all wrong. Peter does not need to be cleansed, which would again be making this about how unworthy he was before Jesus. Foot-washing was not about that, it was more a service of welcome. (As serious in some ways as asking a guest if you can take their coat and get them a drink, perhaps.) Not being cleansed, but being served. Peter simply needs to put himself in the position of saying “I am worthy to be served”. That is the foot-washing. And so this kneeling with bowl and jug and towel, which we can find so odd, so anachronistic, or so irrelevant, becomes instead a yearly gesture of remembering the right order of things. It is something that reminds us not of how much we love God but that first God loves us. And we must allow him to do so. Foot-washing was not the way that Jesus loved them, but a way that he illustrated it. So it is not compulsory to participate tonight. Nor do we need to have this ritual every week. But it is important that we remember this moment between Jesus and his friends, and in so doing recognise that before any of these flawed disciples could be sent out with their great commission they first had to let Jesus love them. However much they wanted to be the first to prove their love, it was Jesus, through his very incarnation, who loved them first. It is absolutely true that we must serve others. It is absolutely true that Jesus sets an example that he intends for us to follow. You are servant-hearted people, and I cheer you on in your trying and failing to serve, even as I try and fail. We will be blessed if we do these things. But do not think that we can do any of these things without God’s love, expressed to us so exquisitely through Jesus Christ. This is how I see it: that we must quiet ourselves down long enough from our striving and serving to hear and understand the divine I love you. THEN we can leap back to our own acts and expressions of I love you, too. Because after this moment comes the hard task of loving one another; even through denial, betrayal, through death into new life, and we cannot possibly do that without the reciprocal love of Jesus Christ.